A. The ADA (American Dental Association) recommends visiting your dentist twice each year for a checkup and cleaning. If you need an emergency dentist, call Dr. Kalantari. Q. 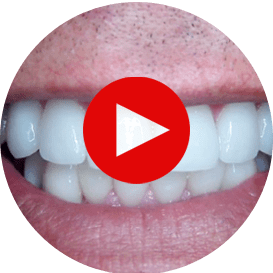 What can be done about a chipped tooth or large gaps between teeth? A. One of the ways is bonding. Bonding is a simple and painless procedure that transforms chipped or widely spaced teeth into a beautiful smile. We will be happy to answer any questions regarding cosmetic dentistry procedures. Just set up an appointment for a consultation. Q. Does my insurance cover procedures such as checkups, cosmetic dentistry, orthodontics, etc.? A. Dental coverage varies, but most policies cover regular checkups, etc. We will work with your insurance company so that you will get the maximum benefits you are entitled to. For those procedures that may not be covered, inquire about financing policy. Q. When will I know if my children need braces? A. During the process of regular checkups, we'll be monitoring the growth progress of your children's teeth. Together we will determine if braces will be needed. Braces are not only important for proper teeth and bite development; they also can enhance the look and structure of your child's face. Braces correct dental problems and can have a significant and very positive impact on your child's well-being. Dr. Kalantari is a pediatric dentist. Q. When should my child come in for their first visit? A. As soon as they have their first "baby" tooth is when they should begin cleaning with a pediatric dentist. Most toddlers will need to have an adult brush their teeth for them. Dentistry for children means proper care of the "baby" teeth will help ensure straighter and stronger permanent teeth. We recommend a first visit at age 2 or 3 to ensure the best possible dental development. Plus, a quick and simple visit can be fun and will leave the child with a positive image of the dental office. Q. Do I have to use special toothpaste with my porcelain veneers? A. We recommend special toothpaste designed for highly polished porcelain ceramics to ensure the beautiful finish lasts. We also use special polishing paste for our patients during their hygiene visits. Q. Am I a good candidate for teeth whitening? A. Patients who experience the most benefit from having their teeth whitened maintain good dental health (i.e. brush three times a day, floss, receive regular dental checkups every six months, etc. ), suffer from slightly discolored teeth and wish to improve the look of their smile for aesthetic purposes. Q. Are there any side effects with Zoom whitening? A. Teeth whitening is a safe, effective procedure, and does not typically include any negative side effects; however, a minor side effect may consist of increased tooth sensitivity to hot or cold. When you’re ready to change your smile and your life for the better, contact Fariba Kalantari, DDS, at Famous Hollywood Dental Care by calling 323.461.4676 or use our convenient Request an Appointment form. We treat patients from the Los Angeles County area, including Beverly Hills, CA, Los Feliz, CA, Studio City, CA, Larchmont, CA and Hollywood, CA.